The Saddle and Pony stools from Humanscale are extremely comfortable because they take the pressure off the spine, forcing the user to sit in a healthier position. The Saddle and Pony Stools can be used in research laboratories, doctors offices, clinics, hospitals, dentist offices, optometrists, universities, factories and virtually any area that requires short term seating. 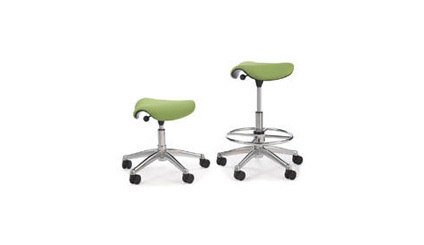 The Saddle and Pony stools from Humanscale fit in just about any area where space is tight. These stools gives users the feeling of sitting in a saddle and comes with a gas lift and casters for either carpet or flooring. I put them in labs, doctors and dentists offices, optometrist offices, estheticians and clinics of all kinds. The stools carry a lifetime warranty and there is a variety of fabrics and finishes to suit the users tastes and budget requirements.